Developmental Dysplasia of the Hip or DDH occurs when the ball and socket hip joint fails to develop correctly. The ball of the hip socket is called the “femoral head” and is at the top of the femur or thighbone. The socket is called the “acetabulum” and this is a part of the pelvis. Ligaments, muscles and a joint capsule hold them together and promote growth and strength. 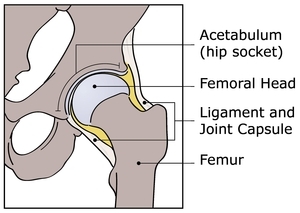 In a normal, healthy hip, the head of the femur is smooth and round and the acetabulum is a smooth cup-like shape and the two sit together like an egg in an egg-cup. DDH occurs when the two don’t fit snugly together and whilst no two cases are the same, there are three degrees of severity.